A new study compares different mindfulness practices with the aim of discovering which one is most helpful for dealing with stress. Mindfulness meditation has long been touted as a way to reduce stress and pain. More recently, it also has gained traction as a tool to improve our relationships, helping us to be more kind and less biased and angry when we regularly practice it. Yet when we talk about mindful meditation, often we are thinking about a combination of practices. These might include breath awareness—focusing on your breath and letting thoughts and feelings pass by without attachment—and loving-kindness meditation, in which you wish yourself and others peace, happiness, and well-being. 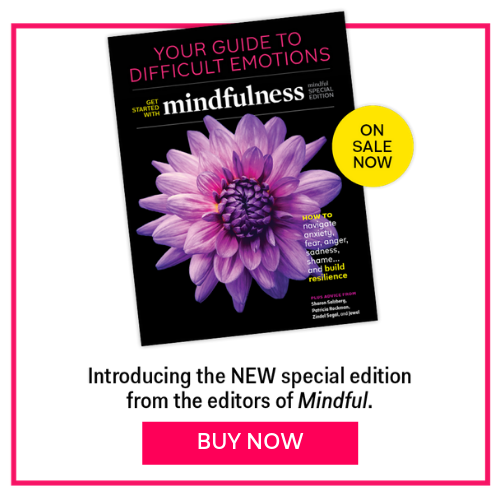 Jon Kabat-Zinn’s Mindfulness-Based Stress Reduction course, for example, includes both of these—plus yoga, walking meditation, and more—all practiced for several minutes a day each. But it’s not clear whether these practices have different benefits, or if they basically do the same thing. So, a recent study aimed to compare practices at a pivotal moment—in the face of a highly stressful event—to see which ones might help people cope better. In this study, conducted by Matthew Hirshberg and his colleagues at the Center for Healthy Minds at the University of Wisconsin, Madison, 156 undergraduate students were randomly assigned to receive training in one of four practices: breath awareness; loving-kindness; a gratitude practice, in which they recollected events from their lives and focused on what made them grateful; or attention, in which they tried to recollect as many details about their living spaces as possible (the control group). Before and after the 12-minute training, students reported on how they were feeling, and then they underwent a stress-inducing task: submerging their forearms in ice-cold water for three minutes while being observed impassively by a research assistant. Afterward, they filled out questionnaires about the experience, noting how aversive it was, how they were feeling, and if they thought the practice they’d learned had helped them cope. After the training and before the stressor, results showed that students who’d practiced gratitude were the only ones who increased in positive feelings (compared to the control group), while the loving-kindness group decreased in negative emotion. Otherwise, there were few changes in emotion, perhaps because of the short duration of the training. It was important to look at how the practices impacted people’s emotions, though, because this seemed to affect the next part of the experiment. Surprisingly, those in the gratitude group—who were in a better mood—found the ice water to be more aversive than the control group, while the breath awareness and loving-kindness groups found it to be less aversive. The gratitude group also felt worse afterwards, while the other groups were less affected. This is not what Hirshberg expected to find. “We had looked at gratitude practice as a potential stress-buffering intervention, but, obviously, it didn’t turn out that way,” he says. What could be going on? Hirshberg found that the people who had the greatest increases in positive feelings after the training also found the stressor most aversive. He believes that the positive feelings gratitude engendered may have been a problem with so unpleasant a stressor—in other words, the contrast may have been too much to handle. “There is something to the idea that just inducing positive affect makes stressful experiences more stressful, rather than buffering against them,” he says. People who learned mindful breathing weren’t less distressed when facing similar stressors, but were more accepting of their distress, which helped them tolerate the stressors better. In fact, Hirshberg says, stress tolerance may not have much to do with feeling positive emotion at all, but some other quality that breath and loving-kindness meditation encourage. Support for this comes from another recent study, where people who learned mindful breathing weren’t less distressed when facing similar stressors, but were more accepting of their distress, which helped them tolerate the stressors better. In addition to its impact on emotions, the researchers also wanted to see how managing the stressful experience affected people’s orientation toward others. So, after the ice bath, the researchers next had participants look at neutral black, white, and Asian faces and note how “likable” each person seemed. Then, they told the participants they were free to go home or to volunteer to stay and help the researchers by looking at additional faces, which served as a test of how altruistic they were. Ultimately, the trainings made little difference in the likability of faces, post-stress. But people in the loving-kindness group were more likely to donate extra time, while the gratitude group was the least likely to do so. “The general picture you get is that practicing gratitude actually enhances the negative effects of a stressor—at least for novices in this study—and also affects behavior in ways we wouldn’t want, like making people donate less time,” Hirshberg says. Overall, gratitude practices seemed to be unsuitable as a buffer against an acute stressor, like the one in this study. People practicing gratitude found the stressor more averse, experienced more negative emotion, and were less likely to volunteer afterwards. On the other hand, both loving-kindness and breath awareness conferred at least some benefit to dealing with the stressor, making it less aversive. And, even after experiencing a stressor, people who practiced loving-kindness were the most willing to help others. Both loving-kindness and breath awareness conferred at least some benefit to dealing with the stressor, making it less aversive. Still, Hirshberg wouldn’t want anyone to avoid practicing gratitude. He points to the plethora of research showing its many positive effects on well-being and relationships. And a long-term gratitude practice may end up being beneficial for resilience over time. But he does suggest that for people who are new to meditation and gratitude practices and are about to face a difficult stressor—perhaps taking an achievement test in school or the SATs, for example—gratitude may not be the best thing to try. This study builds upon a growing body of research uncovering the distinct benefits of different contemplative practices. There is still a lot we don’t know about these practices, Hirshberg says, even though they are often packaged together in mindfulness programs. That’s why studies like his and others’ are so relevant.